Features 12-element construction; high-quality stainless steel; encapsulated bottom; mirror finish exterior; thermo control top knobs; and riveted handles for durability and performance. 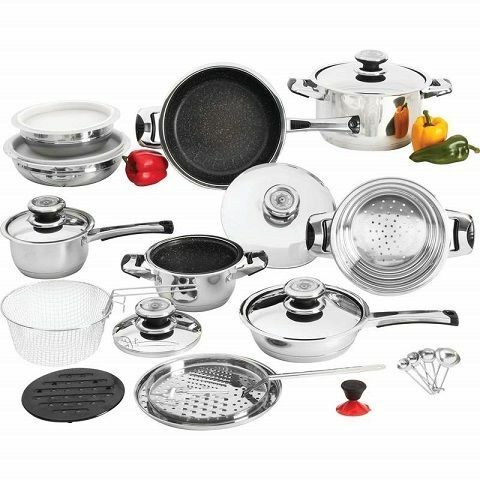 Includes 1.6qt casserole with cover, 2.2qt casserole with cover, 3.1qt casserole with cover, 6qt casserole with cover, 10-7/8" fry pan with cover, step-steamer with side handles, deep fry basket with removable handle, grater ring adapter, grater with removable handle, suction cup knob, 4pc measuring spoons, heat-resistant pan rest, medium mixing bowl with airtight plastic cover, and large mixing bowl with airtight plastic cover. Limited lifetime warranty. Gift boxed.